From casual lettering to gold gilded windows, you would have to walk around Birmingham with your eyes closed to not see some of Zoot’s work. from his 20ft eyes outside New Street Station to the many shop fronts of Digbeth bearing his mark. 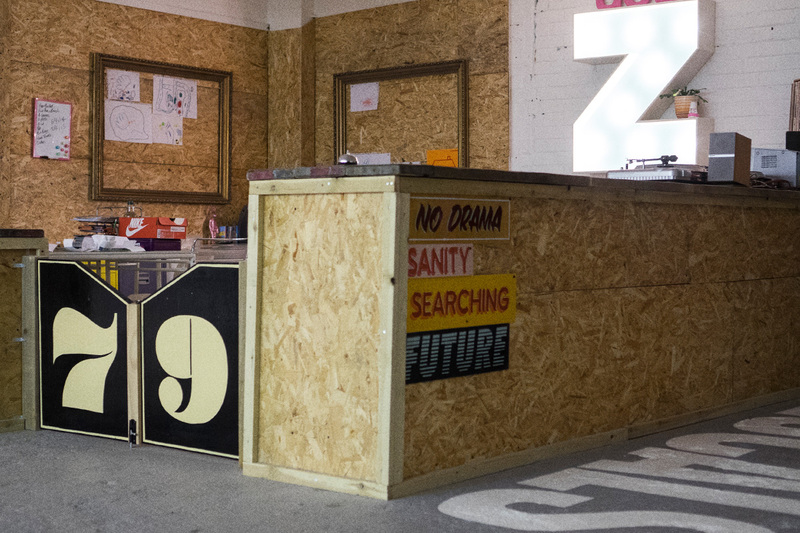 Once an anarchist street rebel, now Birmingham’s signwriter extraordinaire, we caught up with him at seven9signs HQ. When did you first start putting paint on walls of the derelict warehouses and disused buildings, and what triggered it? I guess when I first moved to Birmingham really so around 98-99. I’d played around with markers and put up goofy tags when I was a kid but when I first moved here was when the bug really bit me. I don’t really know what triggered it. It just kind of started. I loved the buzz of getting away with it and seeing something up that I’d painted, I think it felt like a good way to interact with a new city, you know? It’s a good way to discover and explore the architecture of an unfamiliar place and there’s something comforting about seeing your name up like you’ve taken a bit of ownership. How did the transition from artist to skilled tradesmen come about? Typography had always been an important component of my art and when creating pieces I found myself trying to find fonts for use that simply didn’t exist because they were “lettering styles” not stock fonts you can just download and type out but styles of lettering specifically created for and with a brush. I decided to try and learn how to do it so I could incorporate lettering in my artwork. I found a retired old sign painter who was willing to give me a little instruction, so I practised like mad (and I still do). I researched online, read books and just hunted out any information on hand lettering and sign painting that I could find. Before long I realised I’d lost all interest in this becoming a part of my art, I wanted it to BE my art. My entire focus was and still is on lettering and I wanted to paint signs. Fast-forward a few more years of learning and practising and I launched Seven9Signs in the summer of 2014. It just made sense. During that time of study my son was born and that further crystallised that I was on the right path to providing a stable environment for my family whilst still maintaining a creative output. Was seven9signs always part of the master plan or more a light bulb moment? 79 has always been my number and I’m thankful for the path that lead me to where I am now, so I wanted to incorporate that. To me, it’s important to acknowledge where you’re from and by using that as the business name was a way of holding on to my heritage. Traditional signwriting is a dying trade and forgotten art. Years ago before the digital takeover, sign writers were as common as chimney sweeps, but now few and far between. Do you see a resurgence in the trade? I think that a lot more people are tuning in to the traditional crafts again. You can’t beat a hand painted sign; vinyl looks naff and tatty after a very short space of time where as hand painted signs have much more longevity. Sign painting is an exercise in managing the imperfections of the human hand and as a result, a hand-painted sign has a much warmer, honest appearance versus something that was just printed out and stuck up. When I first started, I was hunting out work, now the work is hunting me out, the majority of my clients are independent businesses who have a clear vision of what they are about and feel that ethos should extend to their signage as well. Your signage tells your customers what to expect from your store and having a hand painted sign tells them you care about quality, it’s as simple as that. I’ve done work for multi-million-pound apartments to small independent pop-ups and the one thing they’ve all had in common is an appreciation of quality, craft and heritage. I think there is a real resurgence in the scene with a lot of people having a go and that’s nothing but a good thing. It’s harder these days as there are no real courses or apprenticeships available but if you really want to learn and are passionate about the craft you’ll find a way. There are a huge number of techniques that go into traditional signwriting not just lettering but brushwork, gilding, etching etc; what has been the most rewarding to learn? Totally, there’s a vast amount of skills that fall into the bracket “sign painting”, I love all aspects of the trade but for me gilding is what really excites me. The first time I had a play around with gold leaf I knew that’s where I wanted to specialise. It’s a skill that encompasses most aspects of sign painting; there are loads of processes and variables to get right so it’s forced me to learn a lot of focus and patience. Once you’ve got it right the results are stunning and the possibilities are endless, as well as all the different types of leaf you can also add mother of pearl, abalone, cut glass edges and a whole host of other aspects to keep pushing yourself and the craft further. What are you working on at the moment? Any interesting projects coming up? There’s plenty on the horizon for Seven9Signs in 2016. The sign shop is as busy as ever working with lots of new and established independent businesses. We’re really lucky to have the sign shop in a complex full of other creative companies and are working on a clothing collaboration with our stable mates DarkCircle, they have a great ethos and are doing some big things so it’s a real honour to get to work alongside them on this. We are also working on an experimental project with our other stable mates Dirty Heard, they’re a highly skilled screen printing company with years of experience and well worth checking out if you have any screen printing requirements.